Shifting his focus from Italy's Casalesi crime family to the mafia bosses of the East, the author of the best-selling novel "Gomorra", Roberto Saviano, is now analysing the spread of organized crime in Eastern Europe. This is the topic of his next book. Our interview. 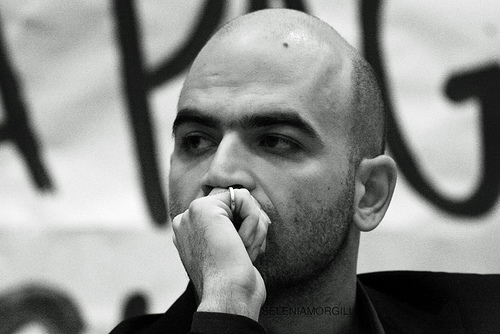 Roberto Saviano writes again - this time from the East. The young author wrote the best-seller "Gomorra", which sold five million copies, when he was twenty-six. Today, he is thirty. He lives under protection, relocates constantly, and isn't as free to move about and conduct research openly the way he once did. But he is still on the lookout for new topics or new angles on old themes. "I am considering a book on Eastern Europe, which is a crucial link in the analysis of the big international crime networks," he says. "In this sense, my teacher was Federico Varese, a criminology professor at Oxford. Among other things, he taught that for many mafias in the East, their contact with the Italian mafias taught them how to improve. This is confirmed by some extraordinary criminal careers such as that of Arkan, the commander of the Serb paramilitary groups and of the Tigers during the war in the former Yugoslavia. It was his contact with the powerful mafia family of Morabito di Platì in Milan which transformed him from a car thief into a dangerous criminal. In addition, I will also focus on how his drug and arms dealings in the Balkans are connected to the Casalesi clan a confederation of crime clans operating in the Caserta region of Italy, even though the Casalesi boss, Francesco Schiavone, a.k.a Sandokan, has always denied knowing him." When did the door to the East open for the Italian mafia? With the fall of the Berlin wall. Misha Glenny explains it well in "McMafia". They were the fastest to profit from the opening of the new markets. Along this line, there is information, although difficult to prove, about how the Ukrainian mafia supported the Orange Revolution in 2004 in the interest of market liberalization. Today, the Italian mafia has outsourced operations to the East that stretch from Russia to the Balkans. Several bosses on the run, such as Francesco Schiavone, a.k.a "Ciciariello," have been arrested in the East. Italians and Slavs have been doing business for twenty years now, even though there are differences in their mentalities. For example, the Camorra from Naples can't understand the Russian clans, which aren't based on family ties, and feels greater affinity with the Albanian crime families. Overall, the mafias have strongly contributed to the dismantling and marketing of the armouries of the former Warsaw Pact countries. And from the other side, when did the Eastern clans enter Italy? It happened in several phases. The Russians tried to acquire influence through a series of crimes committed in the early nineties, but it appears that the Italian clans thwarted this effort. The Italians showed the Russians a list with the names of all of their Russian associates: it was a signal they could take them out one by one. This episode was caught on phone tap by the police in London, where the Russians had moved. At present, with the permission by the Italian mafias, they mostly control trade, although they do not manage it. I remember an interview with a Russian, a former soldier in Afghanistan, who, between lies, was saying how his clan in Rome had him scout out failing restaurants for possible takeovers. Are there any characters who particularly stand out? I remember a Belarussian boss, Guttnik, who was associated with the Casalesi in Naples. He had their permission to deal in drugs and money laundering, and he was killed there in Castelvolturno. He stood out for me because he showed off his cars and clothes just like the bosses. He often surrounded himself with Nigerians, who represent one of the other emerging clans in Naples area who work as subcontractors for the Camorra. It is incredible how much there is to this story: one can find a kind of criminal globalization in the suburbs that one would only expect in a metropolis. Guttnik controlled a big part of the agencies for sending money abroad, and he owned one which still exists. It is at Garibaldi Station in Naples. It was a central point to which a big part of the Ukrainian and Belarussian community from Southern Italy, not just Campania, gravitated. An investigation by the prosecutor of the Partenope Regional Antimafia Department (Naples) traced the extortion from the customs duties on the packages sent by migrants, by way of shuttle buses, to Rome. Then, there was the racket with nannies which was built on extorting control of nannies' reputations: a woman who didn't pay to have her reputation protected would be excluded from job ads or from word-of-mouth advertising and other nannies would spread rumours about her, saying she was ill, that she was a thief, had AIDS, or was an alcoholic. The nanny wouldn't be able to find work. Because of this, I wrote that the restrictive regulations on migrants in Italy, such as security regulations, have the effect of pushing them in the hands of these crime groups. Ukrainians and Belarussians control both street prostitution as well as the more lucrative business of Internet ads for women who make house calls. In other words, they go to a client's house, but they are managed by a member of the clan. They punish people to make examples out of them, but without necessarily killing them. At the hospital in Caserta, I interviewed an Albanian girl whose groin muscles had been cut, disabling her for life, because she reported the racket. The Western prostitutes can work for themselves, but the women from the East, "the sad Natashas" as they are called in Canada, almost never do. Their stories are very similar: they are brought from the East by international trafficking cartels which first take them to Egypt and Israel, then Spain, France, Germany, and Italy. Human trafficking is a goldmine. The situation of truckers involved in the arms trade is similar. The truckers who work for the cartels are beasts of the cargo trucks; high on cocaine, they never stop. Statistics reveal that a high percentage of accidents are caused by these people, but since they are registered in Belarus or Ukraine, they do not have to prove that they have stopped or slept. What happened as a result of the entry of some Eastern countries into the EU? The East escaped from becoming a dominion of crime families thanks to the EU. But the battle is still not finished. Organized crime still controls a disproportionate amount of capital on the market. In the case of the Camorra alone, the cocaine trade brings in sixty times more revenue than Fiat and one hundred times more than Benetton. However, judicial fairness is still lacking: almost no EU country prosecutes "organized crime" as such; at most, they define it in terms of "armed groups." In the East, they do not even define the crime of "outside assistance" and it is difficult to extradite. But at least now the EU is demonstrating that there is an alternative to that, even though investigations by the prosecution and the press in the East are still difficult. I received a letter from Sofia from the daughter of the author of "The Bulgarian Godfather", reporter Georgi Stoev, a former small-time criminal and who was killed in 2008. She asked me to help her commemorate her father. Bringing to light the inner workings of the mafia clans turned you into an icon, not just a target. How do you assess the freedom of the media in Italy today? It is a war of low intensity. It does not threaten lives, but it does threaten careers. There has been a wave of arrests of bosses-at-large in Italy in recent years, even though it remains difficult to seize crime-related property. What is your view of this? Many important bosses have been captured, but some arrests have only taken place after a delay of ten years. In such cases, these are usually over old problems that have surfaced, or involve historic bosses of families in crisis. It is important to also arrest bosses at the peak of their power such as Antonio Jovine and Michele Zagaria. They are involved in cement production and it is organized on a high level. If they talked, they would put at risk the market equilibrium, and this could make them become the new untouchables. They have also been investing in Eastern Europe, among other things. What are the new clan investments in the East at present? They are not just involved in human trafficking, arms, drugs, transport, construction, and laundering, but also with oil. I was surprised by the German police investigation into the heavy Ndrangheta investments in Gazprom stocks. This was also confirmed in Italy by an investigation by Nicola Gratteri of the DDA in Reggio Calabria.